I’m in love with Golden paints. Just head over heels for them! I hope my cooing and gurgling won’t be too loud for you. This is acrylic on a 5 x 7″ piece of Claybord by Ampersand. I started with a thin layer of Golden molding paste. Before it was dry, I added lines suggesting a random grid pattern with my palette knife, then used the flat of the knife to add web-like texture here and there. (Note: This molding paste is not the same product as the light molding paste I’ve used to paint watercolor on. This one is heavier and creates a non-absorbent surface.) I wanted another deep, dark surface, similar to the black gesso I used to create yesterday’s underpainting. So I went with some dark colors such as quinacridone burnt orange, van dyke brown and even threw in a bright one (diarylide yellow, a favorite; you’ll see it there in the top center area of the painting as well). If you’re interested in dipping your toe in the wonderful world of acrylic paint and texture mediums, I can recommend any book or DVD by Chris Cozen. I think Artist’s Network TV (where her videos are featured) is a bargain at under $20/month. All of the major mediums are covered, and you will never need to go elsewhere for inspiration! I hope you are rocking into Monday morning. I think your art supplies may be calling you! Peace. Loving these vibrant, energetic painting Laura! Woot! Thanks, Carrie! I’m opening up to a new phase in my artwork, I think. I appreciate your feedback! What a glorious patchwork of colors! Oh, that iridescent look is so beautiful. Just as you said, it’s a sandbox of color every time we paint. With the texture added in, this one is phenomenal. Way to go! I’m really looking forward to doing something textured. For the last few days I’ve been doing watercolors. That seems to be my weekend routine while my husband is home. It’s easier to practice on something more or less familiar instead of trying to focus on something new. Now, Monday morning is here, the house is quiet since he’s gone off to work, and I can concentrate more. Time to play! Have fun in the playground of color! Texture is … so amazing. Enjoy! you’re welcome Laura 🙂 the way you have used tonal contrasts so effectively…. light against a darker area makes this work really well. It appears on the screen to have enough light to me. this is a very, good work! Thanks, Kathy! I’m a rustic fan too. It does looks like a patchwork quilt which I love! 😍 The textures are so cool with that molding paste…really intriguing and adds so much depth to the piece! Beautiful! I really like that molding paste look. I wanna touch it! No Dawn. No touching!!!!! The color, well that goes with out saying. I did!!!! More than once. You are gonna have to tell me to stop before I get it all dirty. Oh how I’m LOVING this! Could look at it forever! You have such a knack for these with color and texture and light and balance. It is a beautiful patchwork of Laura! These colors are absolutely cooing and gurgling worthy!!!! Thanks, Kerfe! I’ve requested books on him; I think they’re just what I need right now. Thanks again for the terrific uplifting feedback. I hope I have an inner Klee. Even just a molecule! It is absolutely stunning. Well done. Thanks so much, Teri! So glad you like this one. These are some of my favorite colors!! Now I think this is my favorite piece! I can see this as a very large painting. Time to enlarge the size of your canvas, Laura, hehe! This painting delights me! Thanks so much, Sharon! I just love these colors! I did an 8×10″ yesterday over a deep dark vibrant green. Still trying to refine but I do think I’m ready to go larger. At least 8×10, huh? I’m so glad to delight you!!! You are a fan of the warm colors! 💜💛💜 Thanks, friend. Thanks so much, Teresa! I’m really enjoying these! I’m really loving the jewel tone colors in your palette this week! This is lovely. Thanks, Deborah! They are tons of fun. You can’t go wrong with these paints! They just seem to love each other. Love the Quinacridones in particular. Fantabulous! I think there is a trip needed to my art supply shop for some molding paste. You can’t coo loud enough about Golden Acrylics Laura! Lets rock and roll!! Margaret, it is so cool to get great feedback about these paintings. I’m getting ready to pick up a book at the library about the work of Paul Klee, after Kerfe mentioned him. I plan to do a few “inspired by Klee” paintings too. I still need to try your dreamy watercolor abstract idea too! Anyway, yes, I do think the Golden paints are special. And I don’t say that about every “popular” brand that comes along. I’d almost buy them for the Made in USA alone, I think with the state of our economy, we have to do our part. But yeah, I will sail with Golden any day. They give me a big leg up. I may even try their Q’or (I think that’s how you spell it) watercolors do get ready for World WC Month! 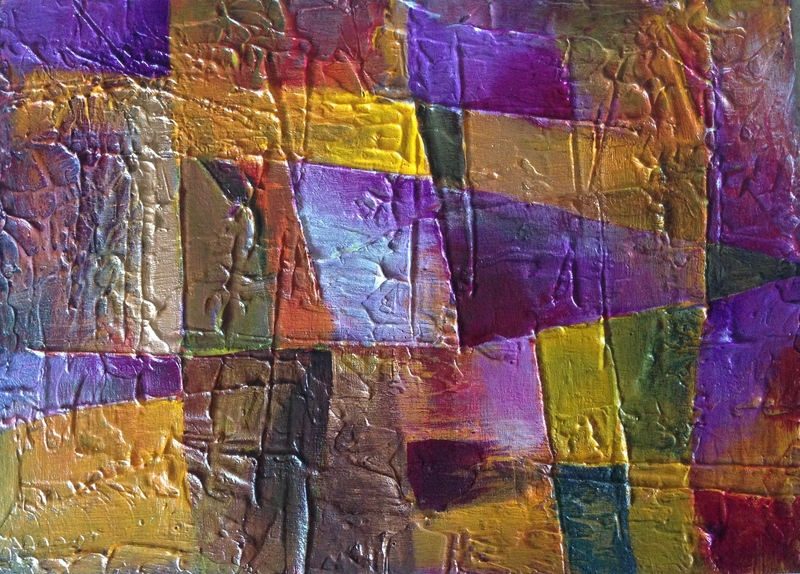 What a yummy, cheerful patchwork of textured colors. Love it. Thanks, Judy, I’m loving making these so much too! Really nice to hear such great feedback, much appreciated! Thanks, Jill! I think painting a quilt is easier than sewing one. lol! Beautiful colors Laura – GORGEOUS texture!!!!! Love that texture! Thanks so much, Deb! 😀 More to come, I hope! Woot! I saw this morning! 😀 You have me very excited about joint compound! I’m doing my best, Tierney! hehe! I think this works really well. Try some more and get bigger. Thanks a lot for looking and commenting, Graham. I plan to do both. Much appreciated! Reminds me of stained glass, but with fabric, except it’s a painting. Some sort of paradoxical puzzle for sure. It’s crazy cool how much texture you can get out of that molding paste. Your balance of yellow and Purple is spot on and the two colors have become two of my favorites recently (don’t tell blue and green) and I love how you used green and red subtly to reinforce the complimentary theme. You just made my day! Thanks, Jesse! Blue and green used to be my faves too. My next painting in this style is an 8×10 and in those shades. It needs more light. I’m working on it. Really appreciate your feedback on this! I love seeing all the different mediums and techniques you use. It really is inspiring. Keep up the good work Laura, can’t wait for your next piece. So glad to inspire you. More later today, I hope. Thank you again. Thanks for showing me the link, Carolina, he is beautiful! Love the way you combined the ink and watercolor and kept it feeling loose. Way to go! Thanks and yes I am glad I can keep the loose feeling! 🙂 Happy that you like it! This is a breakthrough piece Laura. It’s the grid system you like to use but it’s very subtle; and the indentations really make it work…well done! Thank you so much! I’m really glad you think so and I’m so grateful for your feedback, Clinock! Oooh I’m soooo drawn to this!! That texture! The colors! I think I’m having a Paintgasm 😵 I’m going to try this right now! Thanks! I’m more on IG now but not posting there daily. Hopefully soonish. I’m pretty new to art, too, and being involved with the art community here on WP taught me a lot. We’re a helpful and sharing bunch. I’m glad something I learned can help others too. 💜 I appreciate your comments. so glad to discover you! beautiful gallery!